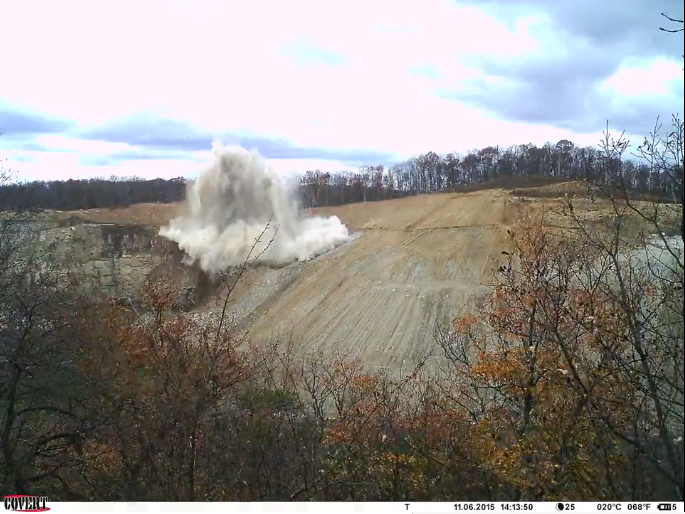 Using Crenova trail cam time lapse photos to get visual of adjacent industrial sand mine (~250 meters west of this stream/wetland zone) sedimentation discharge. Camera is posted at one end of a 4' diameter culvert. Planning to add Riffle monitor at this site to detail stream turbidity, conductivity, depth and temperature. This looks great, thank you for sharing! How long has it been out there, and do you have a sense of the battery life? How often are you shooting? We're collecting documentation on setup here: https://publiclab.org/wiki/timelapse -- any chance you've taken some snaps of how you set it up and pointed it? Following an initial brief posting in early December (cold snap conditions), I re-posted the camera the third week in February attempting to precede warm-ups and snow-melt runoff events. Since I've set-up a single daily time lapse photo format, I'd anticipate a 4 month battery shelf life. I'll provide set-up photos along with additional stream/wetland photos this weekend. Thanks for the interest -- additional feedback is most welcome! That's great to hear, thanks. 4 months would indeed be great. Pretty impressive what you can catch! Thanks Warren. Blasting events resonate landscape and concern! Hi Dwight! Have you tried to up the photos taken per day? catch anything interesting? I'll attach some recent sedimentation examples. We've experienced heavy rain fall and flooding this month which caused moisture damage to the trail cam (last week). I've pulled the unit, and ordered a new camera to replace the water damaged unit. I intend to donate the new camera, and will ship the damaged one back to you for insurance claim purposes. Hi Dwight, wow sorry to hear it was damaged -maybe we should look into a different type of camera @warren . Would have been great to catch some of that runoff footage! That's what Lee was able to use in the past talking to the county. Great pictures here though @gretchen check these out. Wow yeah, i'd thought it was waterproof, but it's good to know (although too bad!) that heavy rains can damage it. Do you think it got submerged at some point? brought the camera into closer stream surface proximity -- apparently too close given the recent flood water. This trail camera is waterproof under normal circumstances. In hindsight, I would have pulled the unit just prior the last storm to prevent damage.